Mayor LaToya Cantrell’s effort to get more of New Orleans’ hotel-motel taxes into the city’s general fund got a boost when the Bureau of Governmental Research (BGR), a nonpartisan good government group, made the case that the city should increase hotel-motel taxes by 1 percent to cover essential services such as sewerage and street repairs. Many people know that most of hotel-motel taxes collected in New Orleans go to the state rather than the city. In fact, more than 90 percent of the money is dedicated to three purposes: tourism agencies, such as New Orleans & Co. (formerly the New Orleans Convention and Visitors Bureau) and the New Orleans Tourism Marketing Corporation (a city agency); the Ernest N. Morial Exhibition Hall Authority (a state entity); and the Louisiana Stadium and Exposition District (which oversees the Mercedes-Benz Superdome and Smoothie King Center). Less than 10 percent goes to the city’s general fund. What the BGR report explains is less well-known — how this unusual taxing arrangement was set up in the first place. In 1966, when New Orleans received an NFL franchise and the construction of the Louisiana Superdome was proposed, voters amended the state constitution to put a tax on hotel and motel rooms in the city to fund the Dome. At the time, the city agreed to suspend its 1-cent tax on hotel rooms in order to soften the blow. That penny has not been replaced or reinstated in the 52 intervening years. 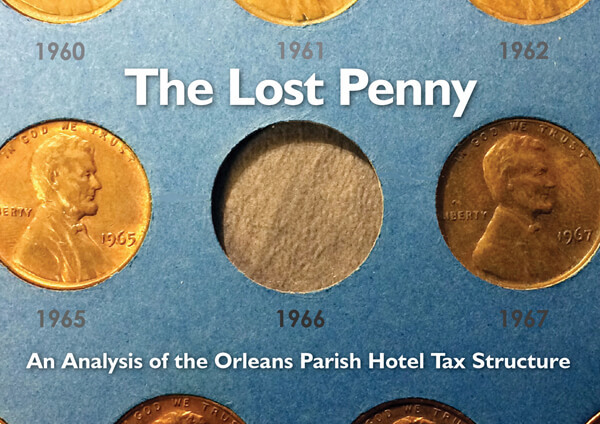 BGR estimates the “lost penny” will cost New Orleans $12.3 million this year. News that the Convention Center is sitting on nearly a quarter-billion dollars in reserves doesn’t sit well with New Orleanians frustrated at the state of their streets and sewer lines. Recapturing some of that money has been discussed by various city officials (and taxpayers) over the years, but Cantrell is the first mayor to make a major push for it, saying she wants it considered during this year’s legislative session. Gov. John Bel Edwards has been cool to the idea, as has Louisiana Senate President John Alario. Perry also has said that reinstating the penny tax on hotel rooms in New Orleans — the plan recommended by the BGR — could depress tourism, particularly conventions. New Orleans & Co. is proposing a .55 percent increase in hotel-motel taxes, from 16.35 percent to 16.9 percent, with the taxes raised going to the general fund. News that the Convention Center is sitting on nearly a quarter-billion dollars in reserves doesn’t sit well with New Orleanians frustrated at the state of their streets and sewer lines. Nevertheless, if state officials are intransigent about revising the current tax structure, a .55 percent tax increase on hotel rooms may be the best deal Cantrell is likely to get, even with many locals on her side.